The Kershaw Amphibian 1006K knife has a 420J2 stainless steel blade that is known to be resistant to corrosion, including salt water. The blade is serrated on one side and plain on the other which provides you with extra cutting options. 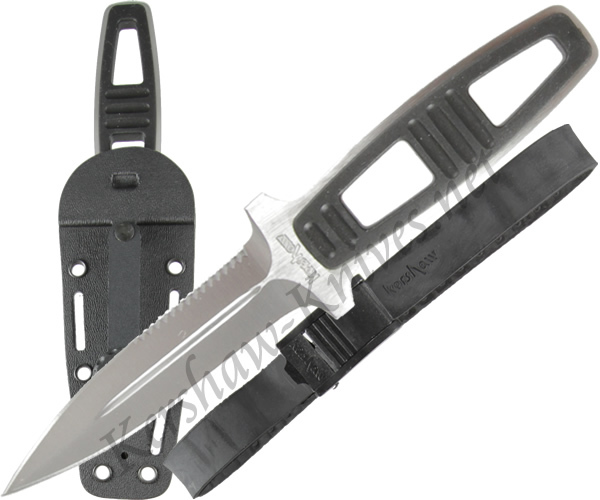 The handle is a stainless steel frame with copolymer insert, making this knife as light as possible for your underwater dive. A kydex sheath is included that has a press-n-pull release so that this knife is deployed only when you absolutly intend for it to be. A rubber leg strap is included that will adjust to the size of your no matter if you are diving shallow or deep.